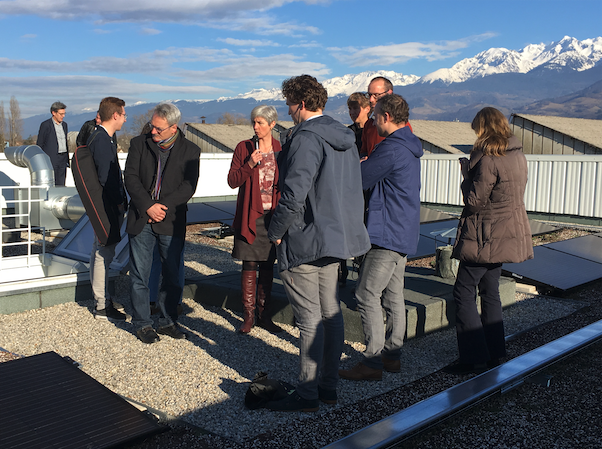 Facing the snow-covered mountains, the Grenoble Local Energy and Climate Agency presented its new innovative project on January 31, 2018: an installation of 55 photovoltaic panels with a power of 16.5 kWp whose electricity produced is self-consumed on site. After a presentation of the functioning, objectives and regulations of the project by Jérôme Buffière, project manager at the agency, the visitors went to the technical room, but were also able to see directly the installation on the roof. This visit was a key event of the City-zen Days. The installation, unveiled before the official inauguration on May 17, 2018, attracted many French and European participants. Everyone was curious to discover this unique model with an intelligent network with a micro-storage (4.5 kWp) and energy management system, designed in partnership with Hespul, also a partner of City-zen. With 80% of the production of panels consumed on site, which covers approximately 1/3 of the building’s consumption, the agency is part of a new approach in France of self-consumption on tertiary buildings. This project, which is an opportunity for the local energy and climate agency to test photovoltaics in its technical, economic and legal implications, also constitutes a model for authorities wishing to embark on this type of project. The agency, which is specialised in consulting and energy support, will be able to provide them with feedback from its experience, especially since this installation was designed to be replicable on other buildings. French legislative framework: Law n°2017-227 of 24 February 2017, which incorporates Ordinance n°2016-1019 of 27 July 2016 on the self-consumption of electricity, establishes a legal framework propitious to the deployment of renewable energy. It secures and encourages a new way of producing and consuming its own electricity by defining self-consumption operations. These can be partial or total, individual or collective and on the scale of a building, a condominium or a district. 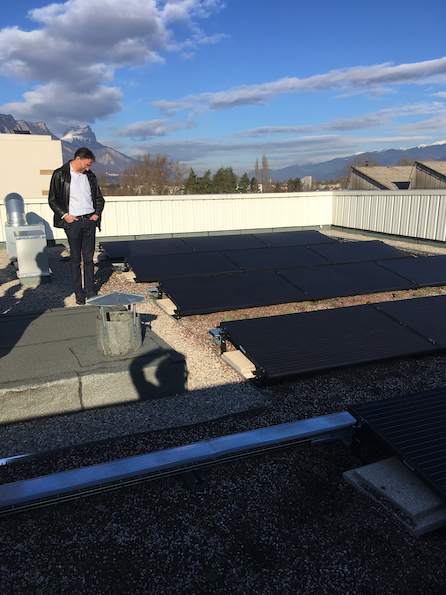 In the case of the agency’s solar panels in the Grenoble metropolitan area, this is a partial individual installation with injection of the surplus on the Enedis network and on the scale of a co-ownership (civil real estate company).